As Jesus said, blessed are the poor who almost end up riding in unsafe taxis and school buses, so that others among them may enjoy lower taxes on their investment income. Verily, one of the weirder political stories this Easter was the news that Transport Minister Simon Bridges and Police Minister Paula Bennett had succeeded in a last gasp effort to persuade Finance Minister Steven Joyce to pony up an extra $10 million to keep the jobs of 26 safety officers in the Police commercial vehicle investigations unit, after safety concerns about a proposal to scrap them. The safety officers, mainly mechanics and engineers, check vehicles such as trucks, buses, mobile homes, and taxis to ensure they meet safety standards, as well as attending crashes involving commercial vehicles and assessing the vehicles involved. Yep, that sounds like it could be a disposable service. Lets consider scrapping the means of ensuring safety standards in the vehicles on roads, and the ability to assess whether structural failings contributed to accidents. How on earth did this work ever get put in jeopardy? Last month Police advised road transport groups they were proposing to scrap the 26 safety officers as part of wider cost-saving measures to stay within NZ Transport Agency’s road policing 2015-2018 budget of $960 million. The cuts were part of a restructure proposal for the “reallocation” of 111 road policing staff in Auckland, Wellington, Counties and Waitemata, mostly into other areas of the police to do a wider range of work…..
All up, it has been a fascinating example of how decisions get made in the prevailing climate of the cost-cutting of public services. (We’re currently amid a process primarily geared to enabling Bill English and his colleagues to reap the political benefits of tax cuts at this year’s election.) It has nothing to do with good governance. Faced with trying to stay within that $960 million budget for 2015-2018, the Police have quietly retaliated by threatening to cut something that would become a political hot potato. 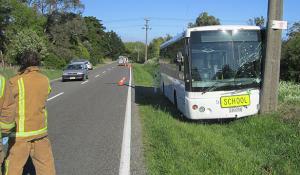 Do the politicians really want to be seen to be putting little kids at risk on unsafe school buses? Hardly. As a result, Bennett and Bridges have ended up petitioning Joyce to save this government from the political consequences of its own cost-cutting ideology. Others can learn from this example of how to apply pressure to the public purse strings. To get this government to do something/anything about funding the unmet need in public health, perhaps specialists should threaten to close down the children’s wards in one or two public hospitals. You know, to enable the government to afford a bigger, more bountiful tax cut bribe to voters this year. How D’You Solve a Problem like Korea? Diplomacy tends to be been slow and boring, like one of those art movies with subtitles. (All nuance, no car chases.) Finally though… with Donald Trump in the White House, diplomacy has become a lot more like speed dating. Last week’s Trump’s spectacular breakup with Russia – America’s hot and heavy date since furtive motel liaisons and sexting back in 2016 – has been matched by his sudden passionate fling with China (until recently the arch currency manipulator and stealer of American jobs) but now Trump’s new partner in pressuring North Korea into submission. Its 50 Shades of Orange on the Korean peninsula. From the viewpoint of Pyongyang, there may not be many viable options left. Last month, the US deployed its THAAD missile complex in South Korea, a system ostensibly aimed at destroying incoming missiles from North Korea. Reportedly, this development has caused fury in Beijing – which sees itself as the potential ultimate target of the THAAD system – and stoked its resentment of Seoul’s apparent willingness to be a US stooge and military platform. The THAAD deployment has also motivated China to take economic sanctions against South Korea; a major concern, given that China is Seoul’s biggest trading partner. Mind you, China also took economic action in February against North Korea, by suspending its coal imports from that country, in an effort to bring the paranoid Kim regime into line. Good luck with that. Back in the US, Trump’s sudden embrace of China is being widely seen as another sign of the (a) sudden demise of White House chief advisor Steve Bannon and (b) the related rise of family insider Jared Kushner and his wife Ivanka Trump. As others have pointed out, Bannon’s main aim was to advance the cause of Trumpism, a conservative ideological movement of Christian populism that Donald J. Trump just happened to lead. This cause has quickly proved to be politically disastrous for Trump. By contrast, the Kushner/Ivanka cause is Trump himself, and their devotion is to Dad’s survival as a political project. If that involves him cartwheeling into embracing all the things – like say, the wisdom of the intelligence agencies – that Trumpism formerly rejected, then so be it. China crystallises the difference. For Bannon and Trumpism, China (and Iran) were the ultimate and apocalyptic enemies of US nationalism, and Russia its natural Christian ally. For Kushner/Ivanka however, China is a transactional partner in economic and diplomatic activity – a country with whom they already do business, and which offers even better business opportunities in future than Moscow. This week at least, Dad seems to agree with them. This was the kind of artistry that masters like Mozart and Picasso created. Truly priceless. Video of Hanyu’s free skate to Joe Hisaishi’s “Hope and Legacy” will be used by coaches around the world for years to come to illustrate to their skaters what perfection is. I believe that if a tape of this is put into a vault and not opened for 50 years, those who find it would be blown away by the stunning fusion of athleticism and artistry that the 22-year-old Hanyu weaved.